This architectural style stands the test of time as one that delivers drama, elegance, and an emphasis on spaciousness. Inspired by a Baroque and early Renaissance architectural style in which a roof’s framework exposed overhead beams crossing at different angles, today’s public buildings and private homes alike strive to capture the same elegance and texture through coffered ceilings. In architectural terms, the word “coffer” means “indentation.” To reconstruct the design, upward indentations in a ceiling are framed by beams arranged in a grid pattern of rectangles, squares, octagons, or other polygonal shapes. The finished product is three-dimensional sunken panels that slightly resemble a deeply grooved checkerboard. Besides their dramatic appearance, coffered ceilings have other benefits as well: They give the illusion of spaciousness, absorb excess sound, and potentially add to a home’s resale value. Intrigued? Before you set off to install a coffered ceiling in your home, read these considerations for the highly customizable design element. While coffered ceilings found in residential homes are considerably less ornate than they’re counterparts in many large public buildings—courthouses, historic churches, and art galleries—the ceiling designs still create quite the focal point. 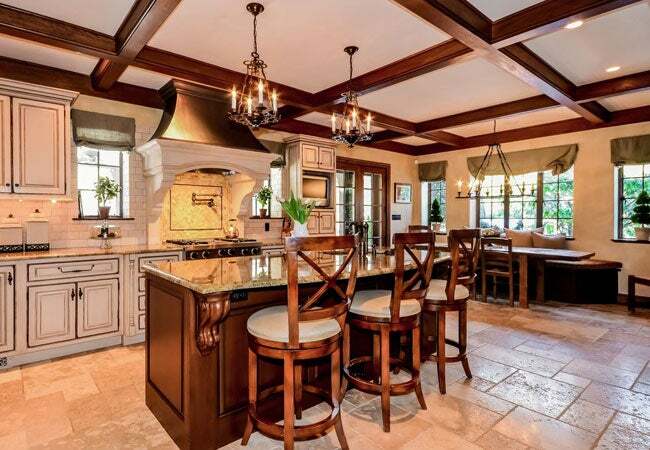 Homeowners often dress up the ceiling by attaching architectural medallions to the coffers, installing tin ceiling tiles or wallpaper in the center coffer panels, painting or staining the beams to create visual depth, and incorporating ridges and scallops into the wood and beams. These design choices make the show-stopping feature easily customizable to the style of any particular home. Although coffered ceilings draw the eye upward, the beams extend downward into a room, taking up some overhead space. Given this construction, coffered ceilings work best in rooms with high ceilings, nine feet tall or more. Rooms with lower ceilings may feel too claustrophobic or cluttered with the addition of coffers. Also keep in mind that the deeper the coffered indentations, the higher the existing ceiling should be—this ensures the bottoms of the beams don’t interfere with head space or visually overpower a room. Ceiling height. Although coffered ceilings draw the eye upward, the beams extend downward into a room, taking up some overhead space. Given this construction, coffered ceilings work best in rooms with high ceilings, nine feet tall or more. Rooms with lower ceilings may feel too claustrophobic or cluttered with the addition of coffers. Also keep in mind that the deeper the coffered indentations, the higher the existing ceiling should be—this ensures the bottoms of the beams don’t interfere with head space or visually overpower a room. Faux or functional beams. 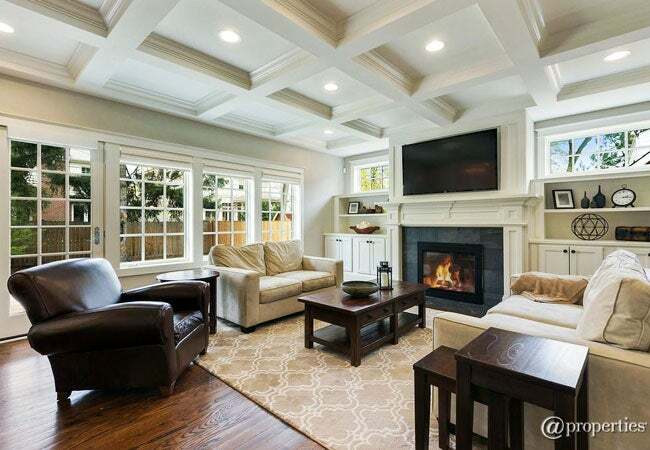 Most coffered ceilings in residential homes aren’t load-bearing, meaning they’re not part of a home’s structural system that supports weight. 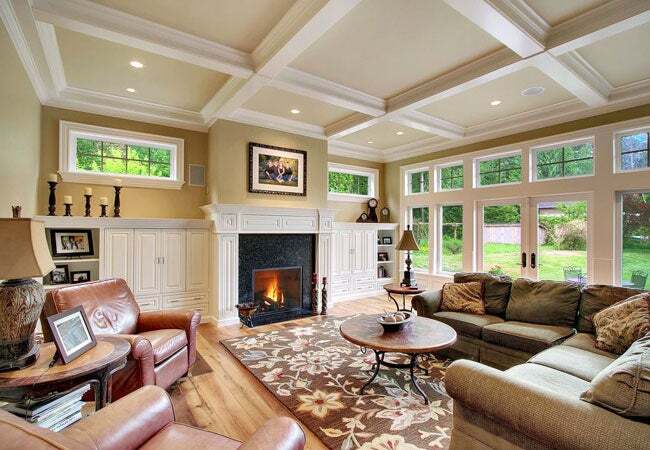 One exception would occur when adding a second story to a ranch home: Homeowners may opt to install a coffered ceiling to camouflage necessary overhead support beams. The majority of coffered ceilings are purely decorative, constructed entirely from hollow faux beams. In fact, if you want large and deeply recessed coffers, an engineer may require additional ceiling support (since even faux beams may add too much weight to a ceiling, depending on the existing joist structure). Installation costs. If you’re planning to install a coffered ceiling, know that the labor-intensive endeavor does require advanced carpentry skills and structural work—that those without proper carpentry know-how should hire a professional for the job. Expect professional installation costs to be at least $25 per square foot. The detail in the design, as well as the type of wood you choose, will affect the final cost as well. Painted pine will be less expensive than stained cherry or red oak, and ornate designs will boost the cost even further. Whether you decide to DIY a coffered ceiling or design and work with a professional to implement your plans, the first phase takes place on paper. Homeowners must decide on the number of coffers they desire, as well as the depth and width of the beams. To achieve a uniform pattern, make sure to figure out the proper ceiling dimensions and coffer dimensions first. Then, after planning the design, the next step is transferring it to the ceiling with chalk lines to represent the position of the beams. Following the standard method of installation, you should first position the main base beams, which run perpendicular to the direction of the existing ceiling joists. At this point, the base beams are only pieces of lumber, such as 2×4s or 2×6s; later, they’ll be wrapped with additional wood to mimic the look of heftier beams. The main base beams serve as the support beams for the rest of the ceiling, so it’s important to attach them securely with adhesive and a nail gun. The base crossbeams, which complete the grid pattern, should be cut from the same type of lumber as the main base beams. The base crossbeams run parallel to the joists and therefore don’t attach to them; instead, they’ll connect to the inner edges of the main base beams with adhesive and a nail gun. The end result should resemble a checkerboard pattern on the ceiling, which is the skeleton of a coffered ceiling. The next step involves constructing the faux beams. To ease the process, it’s a good idea to paint or stain the wood before installation. Depending on the ceiling design and type of wood you choose, you (or your contractor) may opt to frame the sides and bottoms of the faux beams directly on the base beams. As an alternative, the faux beams can also be constructed as three-sided boxes, which are then lifted and installed over the base beams. Then install inside coffer trim and any desired ornamentation, if applicable. Now step back and enjoy the dramatic overhead effect of your English Renaissance-inspired ceiling design!